PURPOSE: The job of the seatbelt is to hold the passenger in place so the passenger is almost part of the car which prevents the passenger from flying forward as the car stops abruptly in the case of a collision. When a car stops suddenly due to a collision with another object such as another car, a tree, pole, guardrail, etc. the car's acceleration decreases very quickly in a short period of time. This is called deceleration. Newton's Law of Inertia explains how this happens. LAW OF INERTIA: An object in motion continues in motion with the same speed and direction unless acted upon by an unbalanced force. As the car collides with another object, the other object provides the force which changes the speed and direction. The car stops going in the direction it was going in, and in some cases bounces back depending how hard of a force hits it or how much momentum the car had. Also, the speed decelerates quickly due to the impact. When all this happens the passenger is not being acted upon by a force to slow them down. This part is where the seatbelt comes into play. As the person continues in their same direction and speed ( forward and the same speed that the car was going) the seatbelt catches them, holding them back from flying through the air. The alternative is to not wear a seatbelt, but a force will still have to act on the person in order to slow them down. This force will come from the dashboard or windshied as the person crashes into it causing a lot of damage to themselves. A seatbelt has two parts. The first part rests over the passengers pelvis and the second part rests over the shoulder and across the chest. When the car stops abruptly the seatbelt applies the stopping force across a large section of the body so the damage is reduced. 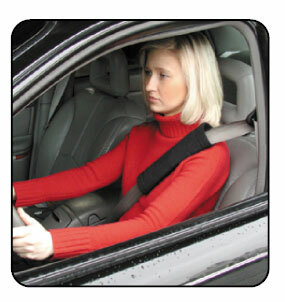 Seatbelts are made of flexible materials which have more give then a dashboard or windshield would have. Since seatbelts are flexible one might ask how do they hold you in place? Seatbelts are designed so that the machinery behind them tightens up the belt to hold the passenger in place when the car decelerates quickly.